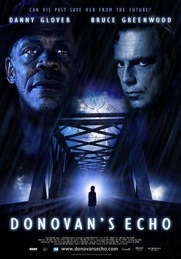 Donovan’s Echo – A series of uncanny déjà vu events force a man to re-examine his tragic past, memory, instinct, and future. Donovan’s Echo was one of those rare films where I had the opportunity to create the sound design from very early on in the process. I prefer to work this way any time I get the chance to, and in every case the results are very worthwhile. I was approached to work on the film in mid 2010 by producers Trent Carlson and Andria Spring whom I had worked with on past projects (The Thaw and The Delicate Art of Parking). The film was directed by Jim Cliffe, whom I realized early on, was very interested in ways that sound design could enhance the character Donovan’s perception of past, present and future. After reading the script, I began to think about what kind of palette I would use to create the sounds that would transition between memories, deja-vu, the present and the future. The “scaffold scene” gave me the idea of using metal resonance as the base for the sound design. That seemed like it would also work well with many of the other key scenes in the film. At that point, I began to record and source out all sorts of metal noises. I loaded them all into Kontakt and began playing and manipulating the recordings. Before the film was even wrapped shooting, I had a folder full of really cool resonant drones and transitional sounds. I was able to begin work on the “scaffold scene” and the final climactic scene in the film early on during the picture edit process. The film had test screenings and having a chance to showcase some of the sound design ideas for a test screening audience is always worthwhile. This gives me and the clients a chance to try things out…If they work…Great! …If not…then sure am glad I know early on rather on the first day of the mix. The other advantage of creating sounds for a film during the picture edit process is that the picture editor (Mark Shearer) was able to include custom SFX into his timeline. Not only do the clients then get familiar to those original SFX in their picture (as opposed to standard library SFX), once the SFX are locked to picture, they also shift along the timeline as new revisions of the picture get created. That way when picture is locked, I can get an OMF of the SFX and editing those scenes is a lot easier as many of the elements are already pretty much in place. I had 4 weeks between picture lock and mix, and I was able to spend that time on detail work and enhancing what was already there. Before the mix, I screened each scene with the clients to ensure that we were in good shape for the mix. As a mixer/sound designer, I need to make sure that what goes to the stage is pretty much to everyone’s satisfaction, as I can’t waste too much time re-doing sound editorial on the mix stage once I’m there. Mix stages are expensive, and time spent there is much better focusing on mixing. The final mix was at Post Modern Sound’s Mix Stage 1 in April 2011. Greg Stewart mixed Dialogue and Music and I mixed SFX and Foley. Mix Stage 1 has a Euphonics System 5 console running 2 x Protools HD rigs for editorial playback and a 3rd for video. I also ran a Digidesign Command 8 as a side car, because even with a virtual predub, I like to have quick access to my elements. My session consisted of 20 mono sfx tracks, 16 stereo sfx tracks, a whole bunch of 5.1 signature Sound Design tracks, 12 foley tracks and 20 Ambiance tracks subbed into 2 x 5.0 pairs. The mix took place over 6 days with an additional day for Printmastering. We won 2 Leo Awards for our work on the film back in May 2012. Best Overall Sound & Best Sound Editing. Below are some examples of some of the Sound Design from the film.